Pickleball is a fantastic hobby for young players for the same reasons it’s great for adults—the nature of the game is a strong equalizer which lowers the barrier to entry, both financially (for their parents) and from a skill-based perspective. Many players have come to pickleball not only from other racquet sports but from non-sporting backgrounds entirely, which makes it ideal for kids who don’t consider themselves particularly athletic. Bring the game to a school gym or community center, and time and again, we’ve seen young players take to the sport like it’s second nature. As noted by Beverly Youngren of the Carlsbad Pickleball group, “While older competitors are often former tennis players looking for a sport that’s easier on the knees, young players often go the other way. They become confident at pickleball and move on to tennis. Carlsbad Pickleball hosted their first tournament for youth in December 2016. At PickleballCentral we’ve seen this trend continue to grow as clubs open up enrollment to kids and start classes or leagues specifically for them. Even manufacturers have started to take note, with some businesses like Paddletek creating paddles specifically for younger players (see the Ranger). We’re always happy to see players of any age take up pickleball, but it’s especially exciting to know the next generation will be bringing some fresh talent to the courts. Younger players have already been engaging in more competitive events as well. One particularly fun example is that of 12-year-old Jack Munro, who won gold with 69-year-old JoAnne Russell in the 2017 US Open Mixed Doubles. They were respectively the youngest and oldest competitors in the 19-49 group! The USAPA launched a Juniors Division in 2016 which was kicked off at the USAPA Nationals VIII Tournament where the kids got a chance to play with pros. You can find additional resources and information on the USAPA site specifically for junior players or those interested in promoting the game to a younger demographic. From both official tournaments to local initiatives, we know pickleball can only benefit from more youth involvement. If you haven’t seen them yet, be sure to check out our articles on the Yavapai Detention Center and Ontario Pickleball Club. Both of these groups are great examples of local pickleball associations that have taken the initiative to provide healthy outlets to kids in their community. We’re glad that existing pickleball communities are welcoming young players with open arms. Do you know of any youth programs or leagues started up in your community? If so, let us know in the comments! Pickleball has a reputation as an old timers’ sport, and that’s fine by us—more time on the courts! But sometimes you just have to wonder: Won’t someone think of the children? Today an Ontario club is sharing how they not only started an adult pickleball league, but created an entirely new pickleball program for kids. This past August, Dan Pronovost of the K-W Badminton Club was awarded a $13,331 provincial grant to start a free pickleball program for the community’s youth. It’s an exciting development that will help show how the game’s versatile appeal while giving kids a positive outlet for their energy. “I’ve been a member of the K-W Badminton Club (KWBC) for many years,” Dan explains. “About 5 years ago, it became clear we’d need to purchase our building to continue growing our club and add additional sports. I joined the board to help manage this process and oversee renovating our 45,000 sq. ft. building. Dan says that his group first reached out to KWPA, the Kitchener Waterloo Pickleball Association, in 2014 to bring the sport onto their six court badminton facility. Thanks to this cooperation, they now have daily pickleball programs for all skill levels. Clearly, the club’s leadership went a long way toward getting pickleball established in the first place. But considering grants are something many pickleball groups would love to obtain, how did Dan make his case? Turns out it was a combination of past experience and finding an underserved demographic. “We became aware of the Ontario Sport and Recreation Communities Fund (OSRCF) through our successful Ontario Trillium Foundation (OTF) grants in past years. In talks with KWPA, we decided that pickleball for youth is a very underdeveloped demographic, since the sport is primarily aimed at seniors. There are an incredible 192 kids that will get to enjoy this new program, where before there were no local opportunities for kids to play pickleball. The KWBC has also run paid youth badminton lessons for over 10 years which have been successful, so they feel confident there will be similar interest in pickleball. Dan says the OSRCF grant will let them to make the pickleball lessons available for free to all participants for the 2016/17 school year, even with paddles and balls being included. With professional coaching, a great venue and free lessons, it’s not hard to see why spots fill up fast. Their aim is to use the OSRCF grant to “seed”‘ the pickleball youth program in 2016/17, then continue with a nominally paid program beyond that to break even. It’s a smart and beneficial model for all parties involved. While securing the grant was relatively straightforward, there are other concerns Dan has about supporting a thriving sports community. “The challenge is maintaining an 80+ year old building for sport use. Since the purchase of our building in 2013, we’ve invested over $500,000 in renovations and thousands of volunteer hours. While we are very happy to have received generous grants from sources like OTF and OSRCF, we can always use more help to further improve the quality of our venue. “We are hoping to further renovate our 10,000 sq. ft. concrete rink pad space, which is used for pickleball and roller derby, by replacing part of the roof, adding heating for better winter usage, insulation, and high-quality floor painting and lines. Adding air conditioning for summer-time use is one of our more frequent member and user requests! Dan says that he believes forward thinking, financially secure non-profit organizations such KWBC are key to helping address shortages of sport space for everyone in the community. He also welcomes and encourages all pickleball players to visit their club, so if you’re ever in the area, feel free to stop by! KWBC hosts a popular regional pickleball tournament in spring, which is a draw for players from abroad to come out and compete. We agree! To our readers looking to expand pickleball offerings in their area, we hope you’ll keep this advice in mind and push local community centers and other facilities to bring our favorite sport to the masses. Thanks to Dan for his time and hard work ensuring pickleball is available to players of all ages! Jack Munro is one of the two youngest players who competed at the US Open Pickleball Championship. Many of the top players in Pickleball know Jack Munro, aka. “Jr. Mint” and are always great with him! Enjoy some of his story! I play with the Engage Encore because I can put more spin on it and I have more control over the ball with it! My dad plays tennis and pickleball. I played baseball until I hurt my shoulder in 2014 and couldn’t play the game anymore. I couldn’t play tennis so I started playing pickleball with my dad, and the rest is history. I prefer playing outdoors because indoors has bad lighting. I like playing the wind. I like BOTH- mostly doubles though- I like having a partner to keep me positive. My favorite place to play is in Simi Valley at Lemon Park. They have wind screens, lights and courts that are even. My secret sauce are spin third shots and spin dinks as well as a 2 handed backhand. I also play right and left handed! My day job is going to school and playing pickleball! I play at least 14 hours a week and in the summer it will be more. I complete my homework first then I go out for 3 hours Tuesday and Wednesday and then the weekends I play from 7 am-Noon. My lucky ritual is wearing different colored socks when I play as well Neon shirt and shorts! I would like to win a 5.0 event. Practice, Practice, Practice and smart shot selections! My mom and dad taught me to do 30 cross-court dinks as a start to learning, then moving to the backhand. Now I can do 100 cross court dinks because I have practiced so much! Having a 2-handed backhand (on the left side) and being able to play both right and left handed! When I make a great shot selection or hit a winner….. I say…..” I LOVE THIS GAME”!!!!!! Betty Catron has the only private pickleball courts, emphasis on more than one, in Knoxville, Tennessee, that she knows of! She has converted her home tennis court into two, count them, 2 pickleball courts. She has a bunch of friends, all former tennis players, who just love the game of pickleball, all 15 or 16 of them! Some of her friends have given up tennis completely and only play pickleball. They don’t let the weather get in the way of playing pickleball. Don’t you just wish you had a bunch of fun ladies like these gals to play pickleball with every day! Thanks Betty for taking the time to share some of your favorite photos of the only private pickleball courts in Knoxville, that you know of! I’ve been chatting with Deanna Wright for about two years about how pickleball is taking off in Payson, Arizona. 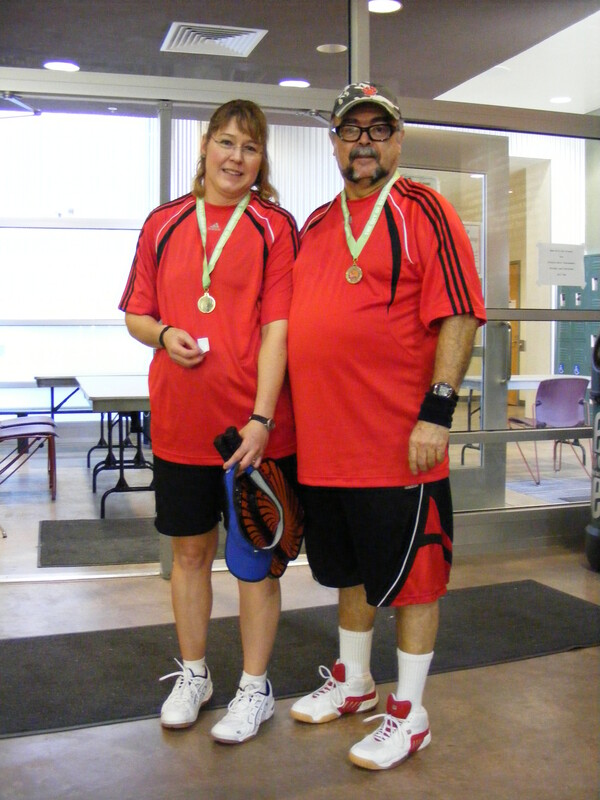 You’ll be delighted by this Payson pickleball success story. Deanna breaks the good news: “Payson recently poured concrete for two brand new courts dedicated to pickleball! “They will be painting the courts soon. The kitchen will be painted in lime green and the rest of the court in a regular green.” Deanna’s huge circle of pickleball friends can hardly wait for the courts to be ready. Deanna has never played on a real pickleball court. She is pinching herself to make sure she isn’t dreaming. 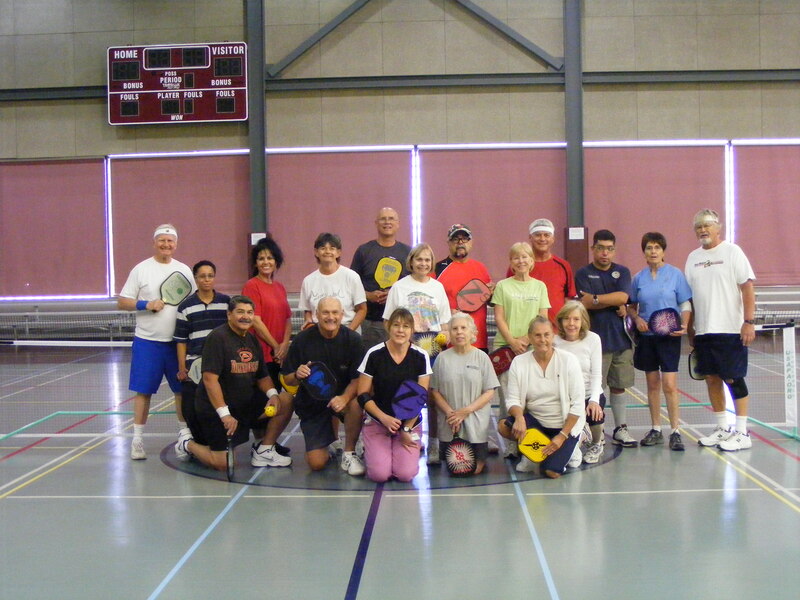 Interest in pickleball has been growing in Payson, Arizona for the last 2 years. As the story goes, Cindy & Phil Galvin told Dianne Wing about pickleball. Dianne researched and taught herself the game. One day, Mike Wing invited Deanna over to join a group playing pickleball. She was immediately hooked on the game. After about 6 months of playing pickleball, Deanna started teaching pickleball to anyone who showed an interest in the game. Just recently, she taught a church youth group and their leaders how to play pickleball. Deanna’s favorite paddle is the Pro-Lite Aero D Graphite paddle. She also likes the Pro-Lite Blaster 2 Alloy and the Phantom Graphite paddles. Deanna is definitely a “Pickleball Spark Plug!” A lot of folks, most recently from Michigan, Missouri and Nebraska, are snow birds. If they stop by to watch while Deanna and friends are playing, Deanna will walk over after a game and answer questions. Usually, they are open to trying the game. Nearly everyone who plays becomes addicted to the game. Deanna has 2 sons. Logan is now 14 and very involved in Special Olympics. His brother Joshua loves sports and is an avid athlete. Mike Wing designed a plywood tool with a hinge and a clamp that made it possible to hold the chalk they used daily to re-draw pickleball lines on one of the tennis courts in town. Plans to build pickleball courts in Chaparral Pines, a gated community within 5 miles of Rumsey Park are underway. “We are here to stay,” beams Deanna about the Payson Pickleball Club. Some of the many people who stop by the Payson tennis courts to play pickleball during the week: Pat Patterson, Jodee Smith, Paul and Jacque LeSueur, Joel Dean, Jennifer Kiley, Mike and Dianne Wing, Maryse Vossler, Joshua and Deanna Wright. Photo by Michele Nelson, courtesy of the Payson Roundup. The Payson Pickleball Club is steadily recruiting some of the other tennis players in town to try the fastest-growing sport in the country! Thanks, Deanna, for sharing your story about your new pickleball courts in Payson! Everyone has a story about how they got started in Pickleball. It usually starts with family! I hope you enjoy Anna’s interview with Rachael Kroog at the 2014 USAPA Nationals in Buckeye, Arizona! Anna; Okay, so here we are with Rachel. Rachael, can you introduce yourself? Rachael: Hi, I’m Rachel Kroog from Minnesota. Anna: And Rachel, tell us about pickleball. How did you get into it? So, I flew down there and I played for a couple days, and we batted the ball around. It was okay. And then a year later, I went back and we played for about a week. Then the hook was set, you know. And I came home and I googled pickleball in Minnesota and found out there was a small group playing very close to my house. And, you know, I’ve hung up my tennis racket and I really haven’t played much since. I call it, “Going to the ‘light’ side” versus “Going to the ‘Dark’ side”. Yeah, so I’ve come to the “light” side, and it is addicting. It’ll change your life in so many positive ways. All generations can play it. I’ve seen grand-kids play with their grandparents and with their parents, three generations out on the court. You know, what other sport can you have fun and compete with three generations? So, it’s really an all-around sport and I highly encourage you, if you haven’t picked up a pickleball paddle, pick one up, find a friend that plays. They will take you under their wing because that’s the pickleball “‘hood”. That’s what we do, we help the beginners. So, go grab a racket. Go grab a paddle. Anna: And Rachel, what did you win today? Rachel: I won the silver medal in the Women’s 50-54. Anna: And this is at the USAPA Nationals Pickleball Tournament. Rachel: In Buckeye, Arizona. The Nationals. It’s real.